Bluff My Call, online at BluffMyCall.com, is a company that has created and sells the ultimate cell phone addition package. This package includes the ability to change Caller IDs and disguise your voice and the ability call to and from anywhere in the world at any time. It also encompasses features such as notes after a call, a phone book, a call log that links to Outlook, and a web control panel that manages everything. At Bluff My Call, you can purchase either prepaid packages, unlimited plans, or pay by the minute. Shop at Bluff My Call to get the latest technology in phone services and stop by RetailSteal.com to find all the best Bluff My Call discounts, Bluff My Call codes, and Bluff My Call deals. Calling rates from Bluff My Call depend on the customer’s location. No shipping fees are involved. Exclusions may apply; see website for details. Enjoy a 20% discount on your entire order from Bluff My Call when you use this coupon code online. Use our coupon code at Bluff My Call online today to receive ten free calling credits. Head over to Bluff My Call today and use our promotional code to receive 25% more minutes. Save 10% on all accounts at Bluff My Call when you enter this exlusive promotional code at checkout. Save up to $30 when purchasing unlimited plans at Bluff My Call with the coupon code. Click link to save. At Bluff My Call, get one free minute for every minute you purchase online. Click link to buy. Get double the amount of minutes at Bluff My Call with the coupon code. Click link now. 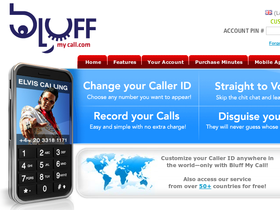 Visit Bluff My Call and purchase 60 minutes of caller ID bluffing for the low price of $10. Check out Bluff My Call now and receive 7 minutes of fast, easy fun for free. Get free unlimited two-minute calls at Bluff My Call. Click link to find out how. Try Bluff My Call completely free for 7 whole minutes.